Hello, friends! 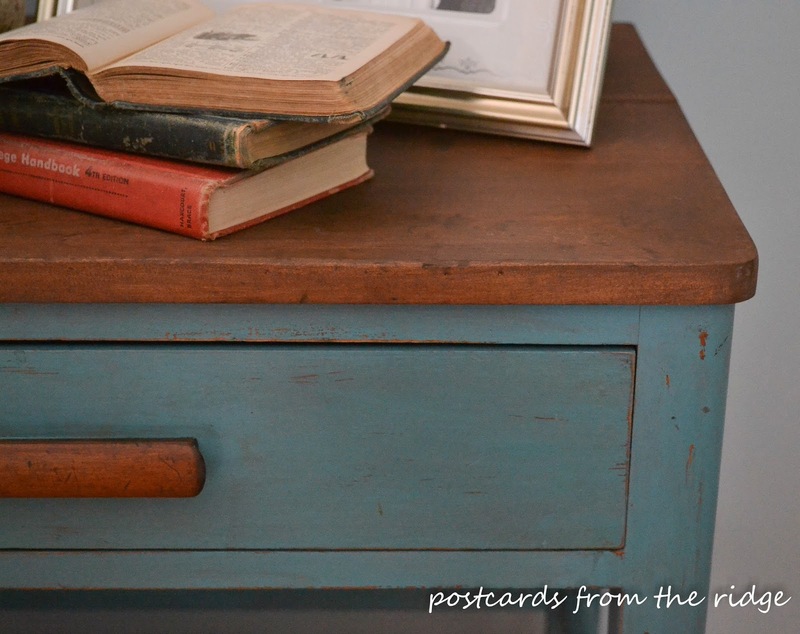 Today I have a tale of two night stands for you. They didn't begin their lives as night stands. Their early lives were more exciting than that. 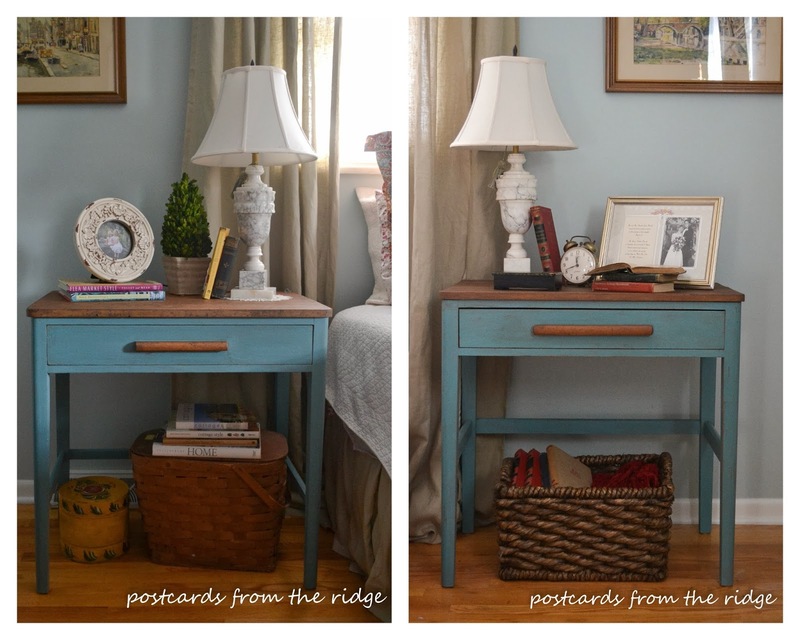 They started out as desks in the original military-type housing in the town I live and grew up in, Oak Ridge, Tennessee. More recently, they were used as storage in someone else's garage and had become sad, oil-stained, and neglected. Now they have a new lease on life as our night stands. My night stand. I decorated it with some more feminine items and a basket for storage. The Mr.'s night stand also has a basket for storage and I added a few masculine items on his side. 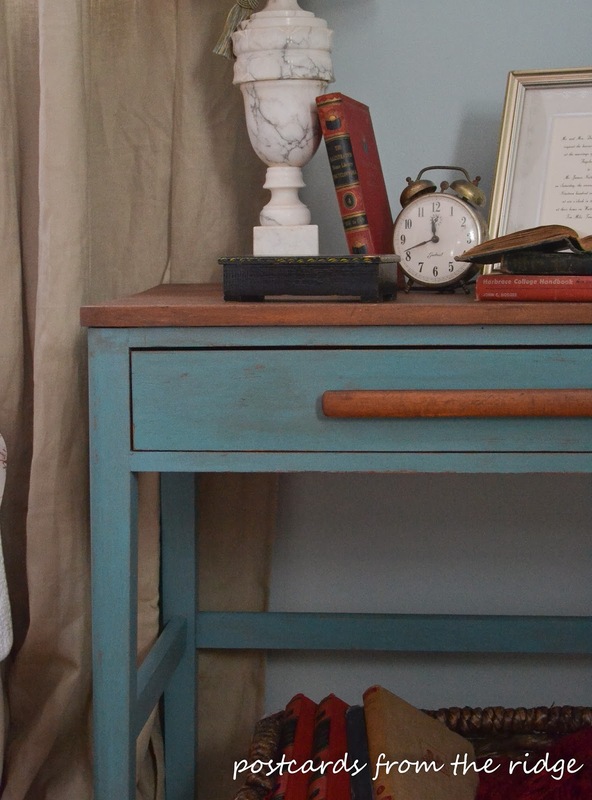 I like the red accents paired with the turquoise. 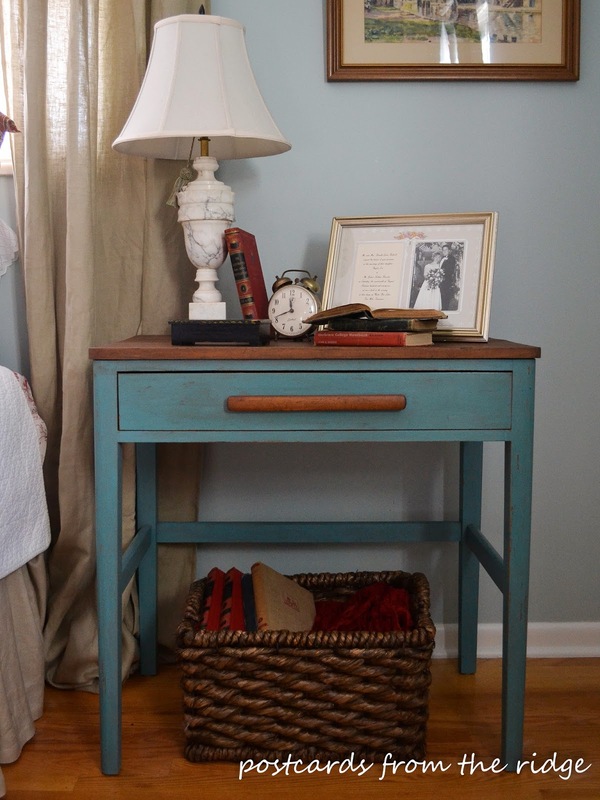 Earlier this month I had taken out a small oak chest of drawers that I had been using as a night stand and replaced it with a gate leg table. 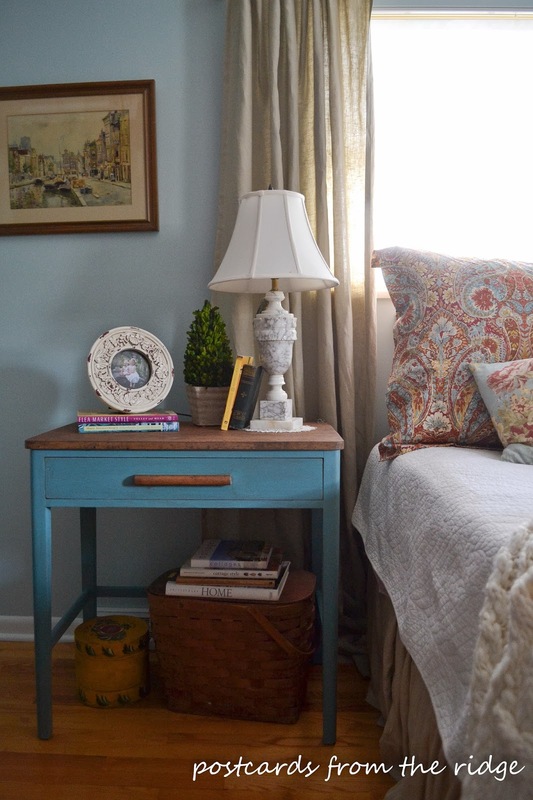 I wanted something more open than the chest of drawers, but the table just wasn't right for the space. We needed something with a drawer for our "stuff". And then I found these at an estate sale. They were in the garage of the home, covered with oil stains and gunk, kinda gross, but the price was right. And they were exactly what we needed for our night stands! After lots of cleaning with Gloss Off, the makeover began. 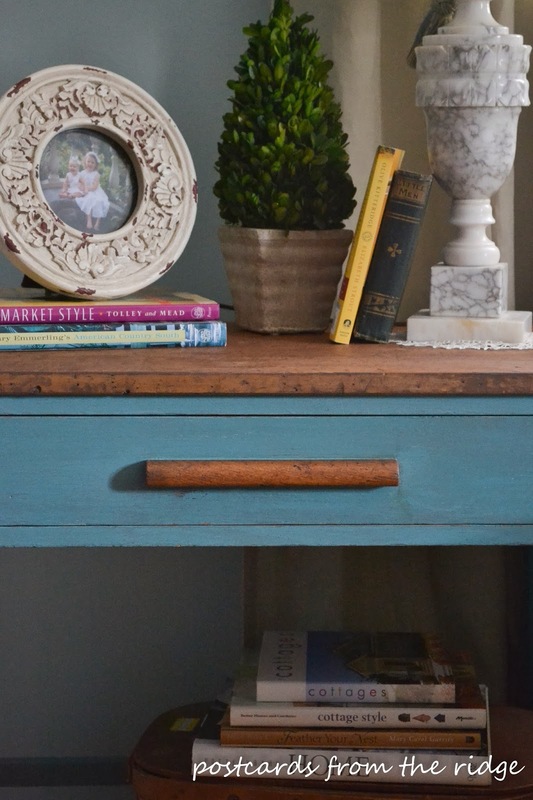 For the paint finish, I created a color using two different shades of blue and used it for the base. 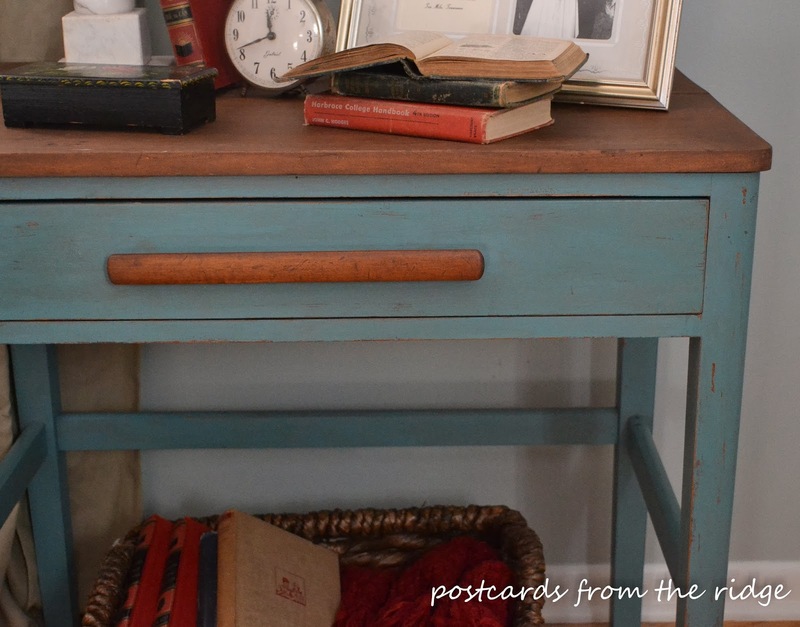 After it dried, I distressed it and then did a wash with a gray milk paint to give it some variety in color. Then I finished it with Clapham's Wax. I love that stuff. The tops were sanded and stained with Zar Mocha Stain, and then I finished them with a coat of Modern Masters Dead Flat Varnish for protection. I've got some old books on the top and in the basket, including a vintage college handbook. 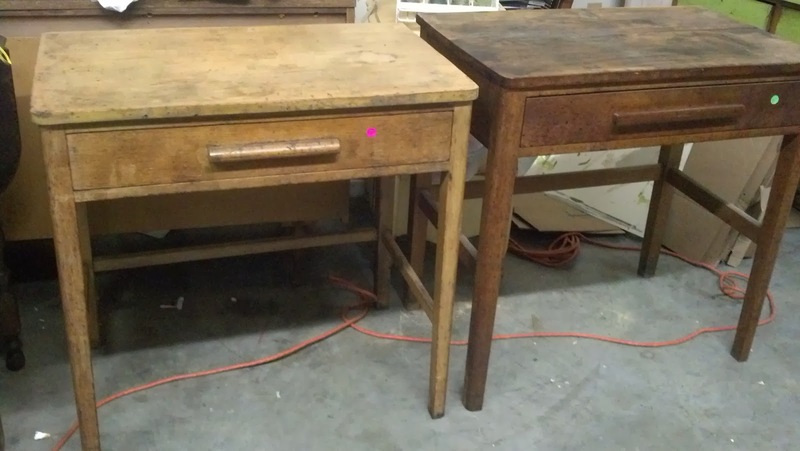 Appropriate for an old desk, I think. Here are the two side by side for comparison. They're not identical twins. The one on the left is slightly smaller and is made from oak. The handle is also smaller. I'm not sure what type of wood the one of the right is made from, but it's definitely not oak. Again, they are exactly the same color, but the light from the bathroom made the right desk look a little greener. 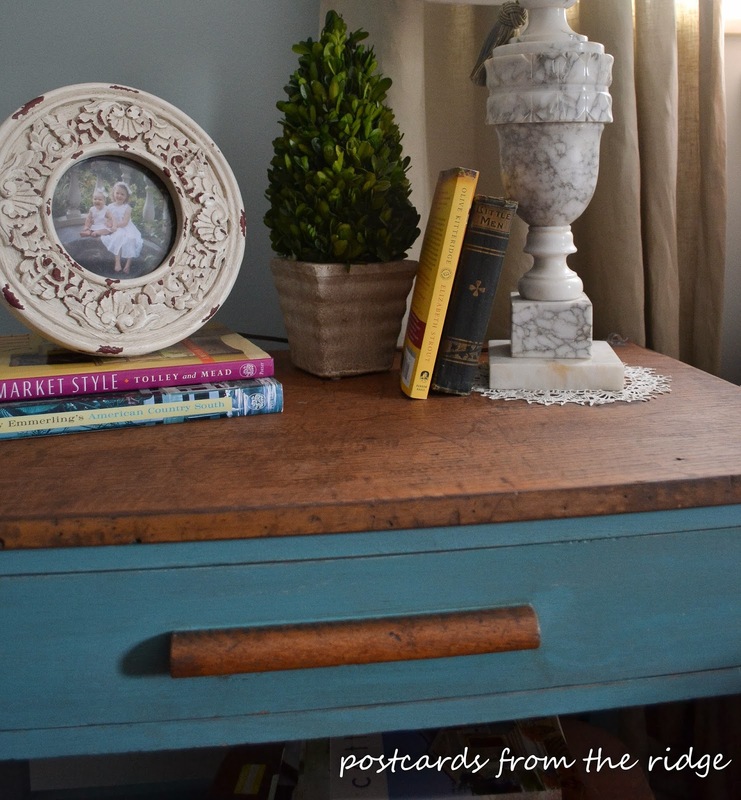 Books, boxwood, a photo of the girls when they were little, and my favorite old alabaster lamp decorate my night stand. 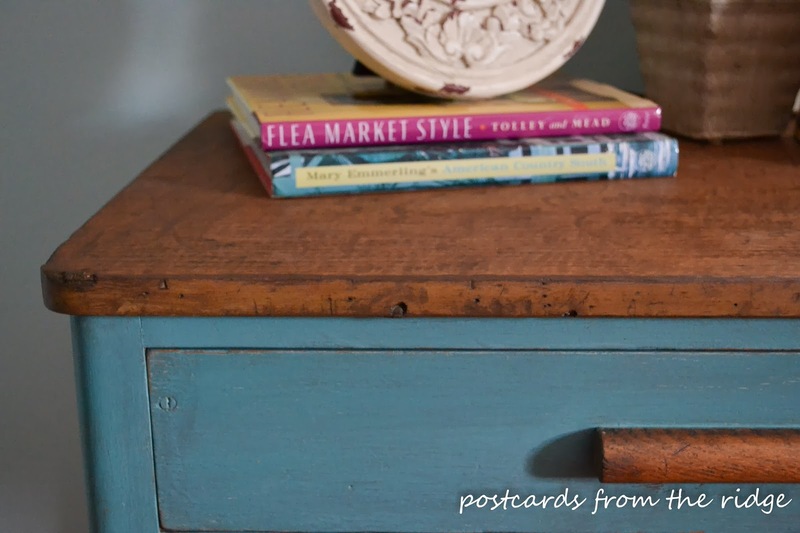 A tole painted can and an old jumbo picnic basket underneath make excellent storage. The top had an oak veneer and I didn't want to sand it too much, so many of the scratches and flaws are still there. They are very rustic and have lots of personality, just the way I like things. Here you can see them both in their new lives, on either side of the bed. They are exactly the same color in reality. I had the light on in the bathroom and it was casting a bit of a yellow glow on the right table, and the bed skirt too. So now you know. And lastly, my cat wanted to be part of this post. 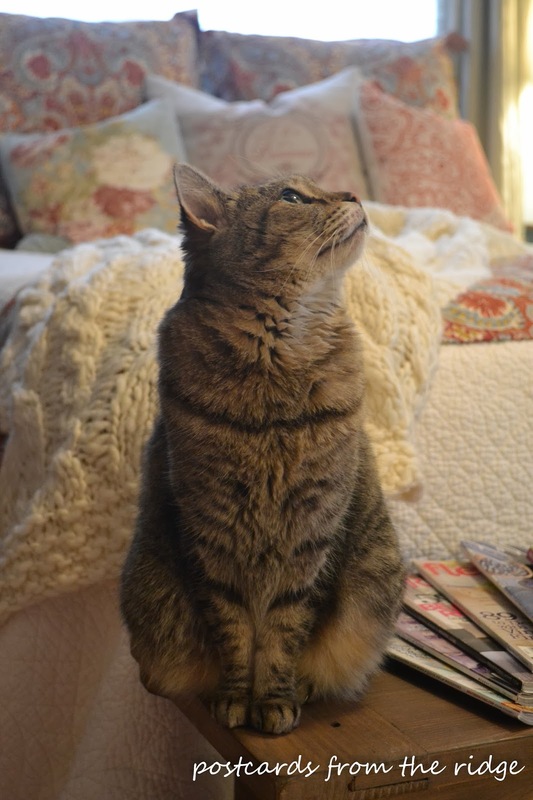 She's the cutest cat on the planet, and she thinks she has to be in every photo shoot. How could I resist? 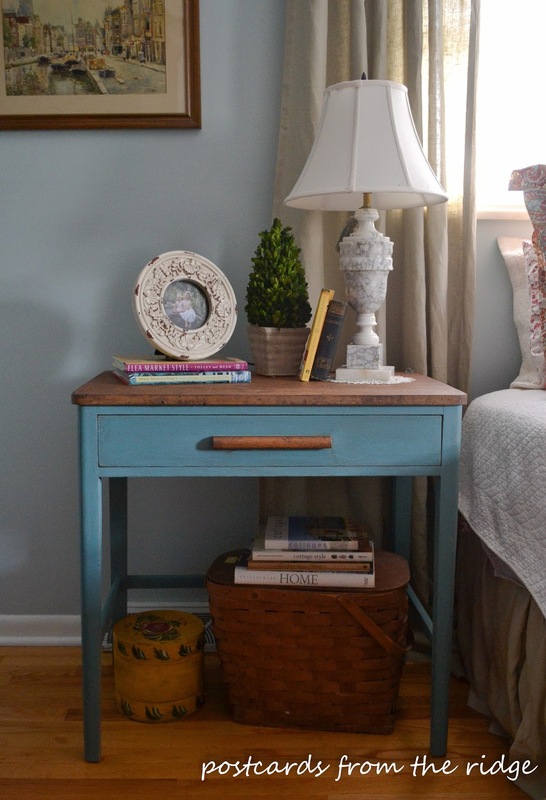 So what do you think of our new old night stands? I always love it when I can give a brand new life to something that's been cast off and forgotten. And these are just the perfect size for us. If you like this project, go here to check out my other painted projects. The opinions in this post are mine, based on my own personal experience using the specific products mentioned here. I have not been paid by any of the brands mentioned to recommend their products. I am, however, an Amazon associate and a Wayfair affiliate, which means that if you purchase something from them after clicking a product link listed here, I might make a few cents from the sale. Please follow the manufacturer's instructions for any product you use. they look great! I LOVE that you put your bed under the window...I always wanted to do that but our headboard is too high and blocks some of the window. Thanks, Cheryl! Funny that you mention that your headboard blocks some of your window...we don't have a headboard. But maybe it isn't too noticeable! Anyway, I hope to have one soon, and it will likely block some of our window. Oh well! C'est la vie! 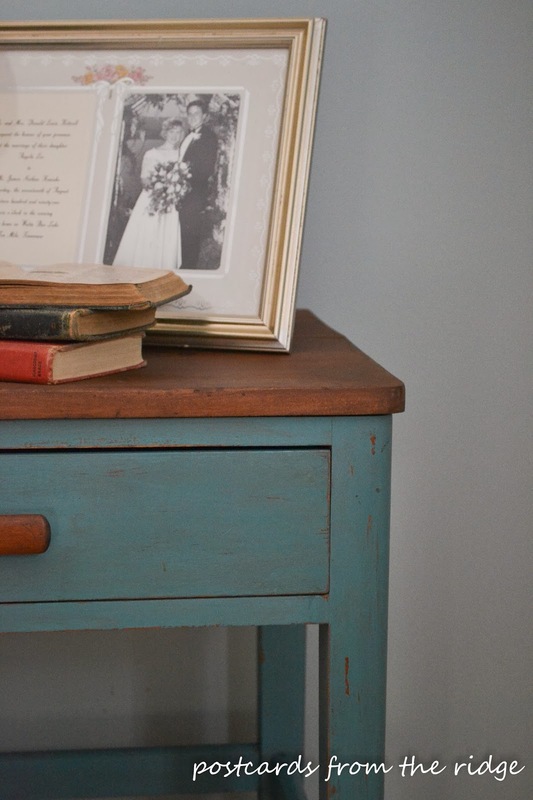 I love, I mean LOVE, the color you created for your nightstands. They look perfect in your bedroom, and I think it's so cool they aren't quite the same. It's like that game of two pictures, and you try to find what's different between them. You really have to look hard to see the differences. Fun! Thank you, Laurel! They are really similar, and I'm sure nobody would know that they weren't the same if I didn't point it out! Thanks for dropping by! 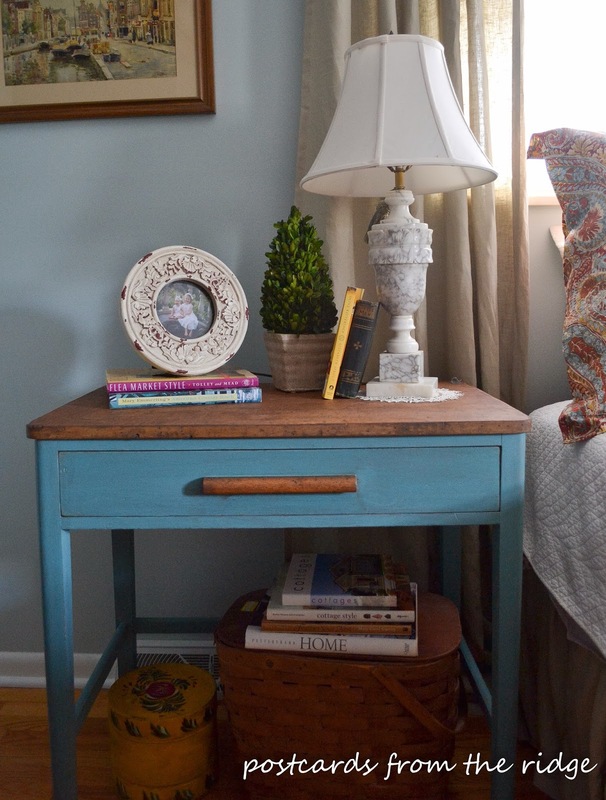 The desks turned nightstands look great Angie! Love the custom color and the not so perfect tops and I love their history. Great transformation! Thanks, Holly! I like that they're unique, right down to the color! Have a great weekend! Really beautiful. 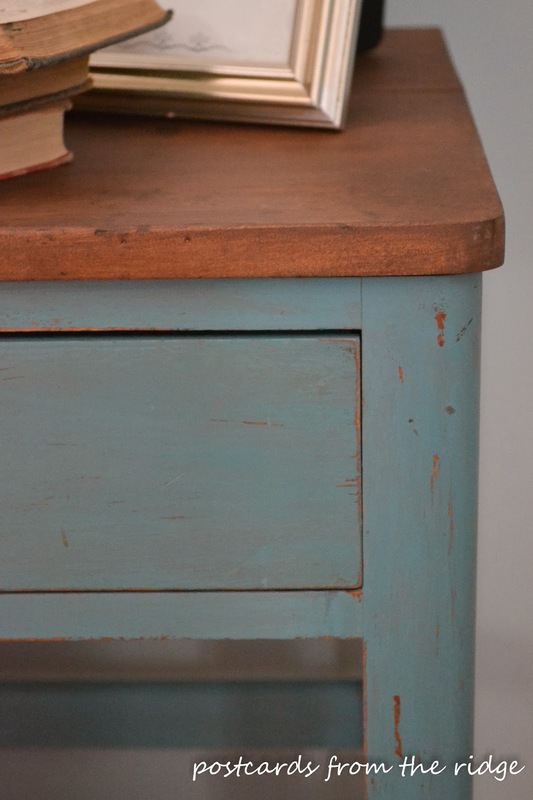 Love the colour and the contrast to the natural wood. Well done! They are beautiful. Love the colour and the contrast to the natural wood. Angie, I think are really beautiful. 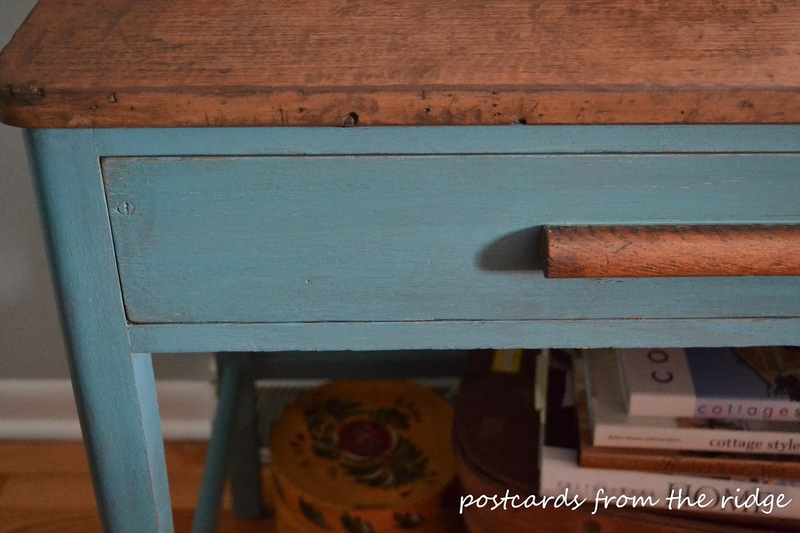 I love the color and that you left the tops stained and the handles. 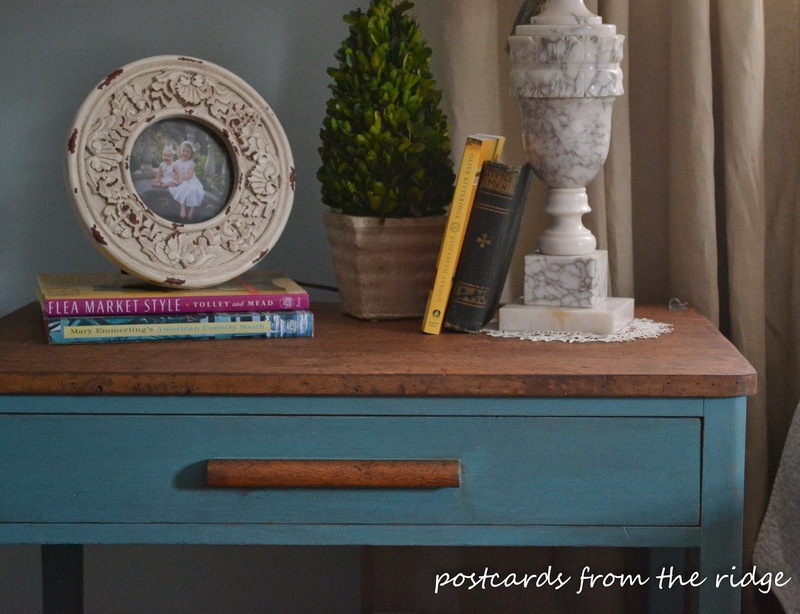 Beautiful vignettes as well. The cat looks like it I a ham with pictures, LOL!! Thanks, Cynthia. 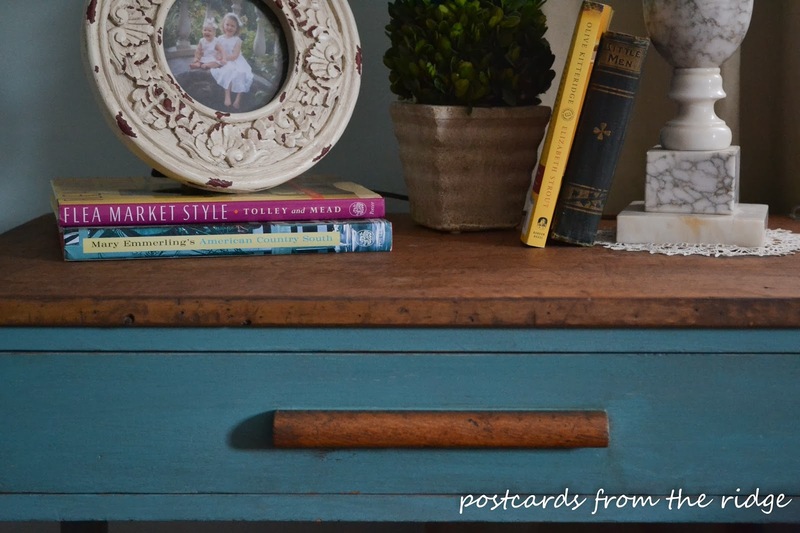 I thought about painting the tops and handles too, but wanted to leave some of that rustic charm showing. The cat loves to be in pictures, but actually is not very friendly. It's all an act! Have a great weekend. Thanks, Bonnie! They fit the space perfectly. The cat is cute, but not so friendly in reality. But we love her anyway! Have a great weekend. I love these. They are the perfect size for the bed. It's neat that they ate from the military housing. 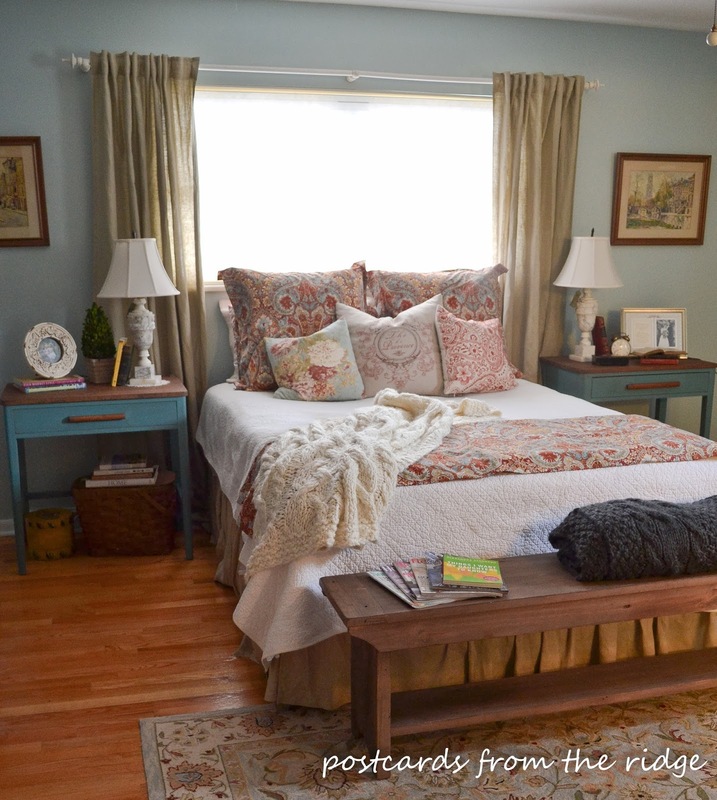 Nice color and great staging! Wow, those look like they were made just for your bedroom! How perfect! 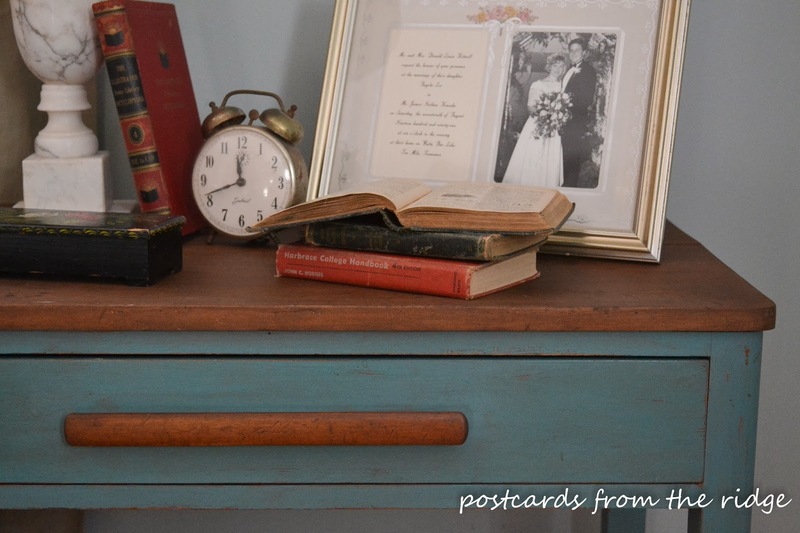 Love that you left the rustic tops and pulls. I would love for you to share some of your pretties at my link party. The very first one is Friday, Jan 31st at FlyingC-DIY.com I hope to see you there!